Qabalah or Kabbalah (Hebrew : קַבָּלָה‎, lit. “receiving”) is a discipline and school of thought concerned with the mystical aspect of Judaism. It is a set of esoteric teachings that is meant to explain the relationship between an infinite, eternal and essentially unknowable Creator with the finite and mortal universe of His creation. In solving this paradox, Kabbalah seeks to define the nature of the universe and the human being, the nature and purpose of existence, and various other ontological questions. It also presents methods to aid understanding of these concepts and to thereby attain spiritual realization. Kabbalah originally developed entirely within the realm of Jewish thought and constantly uses classical Jewish sources to explain and demonstrate its esoteric teachings. These teachings are thus held by kabbalists to define the inner meaning of both the Tanakh (Hebrew Bible) and traditional rabbinic literature is a discipline and school of thought concerned with the mystical aspect of Judaism. Qabalah Hermetic is a Western esoteric and mystical tradition. It is the underlying philosophy and framework for magical societies such as the Golden Dawn, Thelemic orders, mystical societies such as the Builders of the Adytum and the Fellowship of the Rosy Cross, and is a precursor to the Neopagan, Wiccan and New Age movements.The Hermetic Qabalah is the basis for Setian Qabalah as studied in Orders such as the Typhonian Order and the Dragon Rouge-Ordo Draconis. 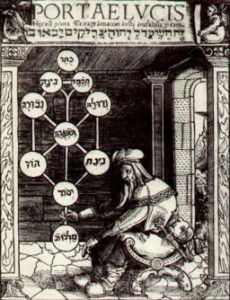 Qabalists see the cards of the tarot as keys to the Tree of Life. The twenty one trumps and the fool are often called the “Major Arcana” or “Greater Mysteries” and are seen as corresponding to the twenty two Hebrew letters and the twenty two paths of the Tree; the ace to ten in each suit correspond to the ten Sephiroth in the four Qabalistic worlds; and the sixteen court cards relate to the classical elements in the four worlds.